Extracts from "Lectures on Military Dentistry, Med. Dept. U.S. Army"
The regiments are usually provided with two dental officers. While they are provided with field equipment and dental supplies sufficient to accomplish a great variety of restorative work and the usual simple extractions, it is not expected that the duties of the regimental dental officers will be limited to dental service alone. In camps, at training centers, and rest areas, this dental outfit, M.D. Chest, No. 60, will be set up in the regimental or battalion dispensary. Here the usual dental emergencies will be attended to at stated periods each day. This new equipment consists of a single medical chest and contains chair, engine, instruments and supplies. The all-metal chair can be set up in less than a minute. The foot engine is the same cord-type engine that was universally used a score of years ago. The instruments have been carefully selected and are made of stainless steel. 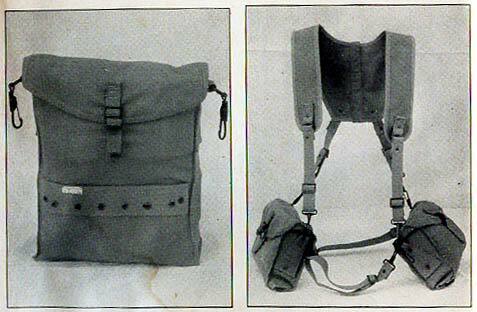 many of the latest instruments and supplies are funished in the field outfit. The dental officer is a Medical Department officer. This naturally implies that he should be available for other duties, essential for the proper operation of the regimental medical detatchment. These other assignments might require administrative responsibilities or even a wide variety of professional service as an auxiliary medical officer. Under the supervision of a medical officer, the dental officer can often subsitute for other medical officers. Occasionally, the dental officer will be the only officer available to assume charge of a battalion aid station or the medical detachment. In camp there are boards, courts, and other special duties to which the dental officer may be ordered to serve in some capacity. 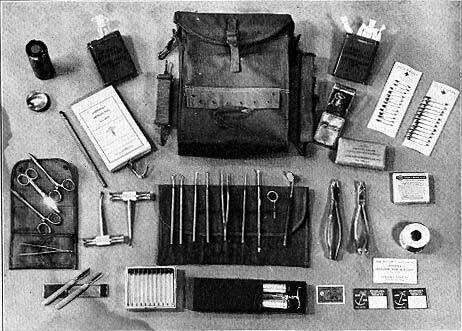 The large number of routine duties to which the dental officer may be assigned in camp, on the march, or in combat make his value to the medical service more and more important as he gains experience. 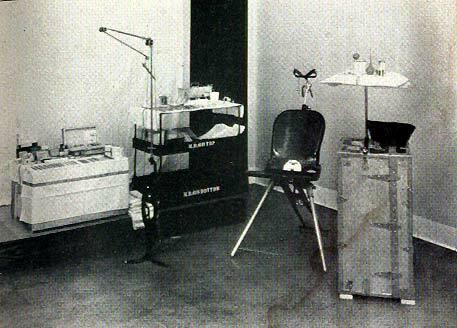 Prior to moving into the combat zone, the camp dental equipment (M.D. Chest, No. 60) is stored with other medical equipment at the point designated. This is usually near the rest area. All division equipment not required in the combat zone is usually left at a place, designated as the division dump. It may be in some building but is usually piled up and covered with tarpaulins. 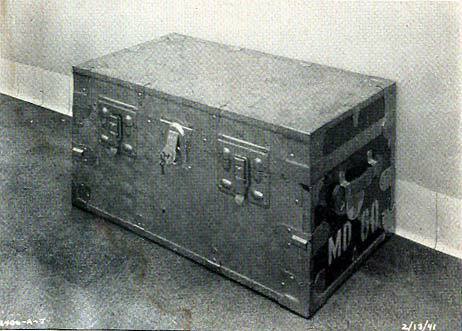 The regimental medical equipment, baggage, etc., is stored in this fashion and a guard posted to protect it. The contents of these three bags provide instruments and supplies necessary for extractions and other simple emergency dental treatment. 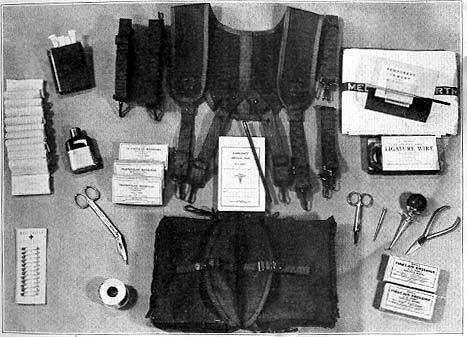 These kit bags also carry a large number of first aid packets, dressings, hemostats, suture needles, suture material, scissors, tissue forceps, scalpels, morphine, and adhesive tape for the first aid treatment of gun-shot wounds of the face and jaws and other battle casualties. Also, in the T/O for the Infantry Regiment, 1942, the Dental officers & Enlisted are assigned to the Hq, Regimental Aid Station. (2) A captain, Dental Corps, assigned to the regimental aid-station squad, is the regimental dental surgeon. He may be assigned during combat to any of the sections as a reinforcement or as a replacement for a medical officer. A second dental officer, a first lieutenant, is the assistant regimental dental surgeon.